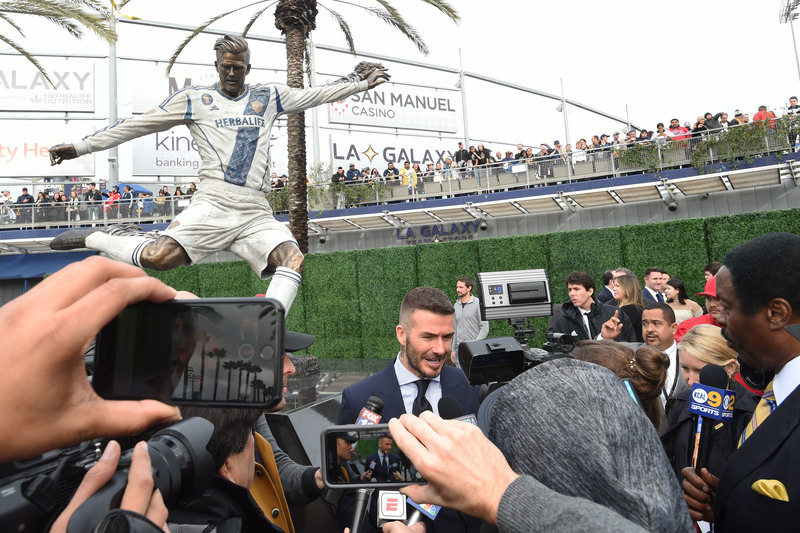 David Beckham said he laughed and almost cried after an unflattering statue of him was unveiled as part of a James Corden-inspired prank. The former England captain was tricked by Corden’s Late Late Show into believing a deliberately poor quality statue, including an elongated chin and oversized bottom, was the one that would stand outside Los Angeles Galaxy’s stadium. In fact it was a fake, loosely based on the genuine statue which had been commissioned to stand in front of Dignity Health Sports Park and was a year in the making. In a dummy ceremony, which Beckham attended believing he was being given a preview before the statue was unveiled to the public, the 43-year-old just about kept his cool when the unflattering likeness was unveiled. He then added: “There’s no way that can go at the front of the stadium”, saying that the long arms made him look like Stretch Armstrong. The prank, which aired on the Late Late Show on Monday, ended with a forklift truck knocking over and destroying the statue before his friend Corden revealed himself to a smiling but swearing Beckham. Beckham posted a clip of the reveal on his Instagram page and wrote: “One day I will have my revenge @j_corden @latelateshow but thank you for making me laugh and almost cry”. Corden said the prank, which took place before the genuine statue was unveiled to the public earlier this month, took three months to prepare.